I have a bad habit of not cleaning the shop while I’m working on a large project. I could make all sorts of excuses for my behavior, but I really need to do better. Thankfully the weather this weekend was a little cooler and the end tables are done, so I was able to tackle the mess in the shop. While I was at it, I took the opportunity to reorganize a few things so that work flow will, hopefully, be a little better. I built my small shop a few years ago so that I would have a place to tinker. When I had it finished I just moved my tools in with no plan on how I was going to use the space. Hell, I didn’t even have a workbench. So I floundered around in the space for a while until I stumbled on Paul Sellers’ website. 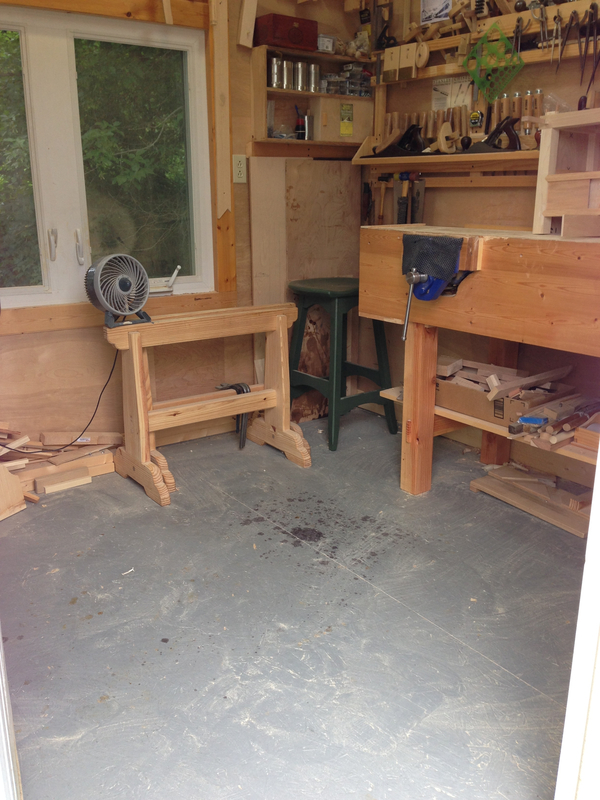 Soon after, I bought his book and built my workbench from the plan that is in the book. 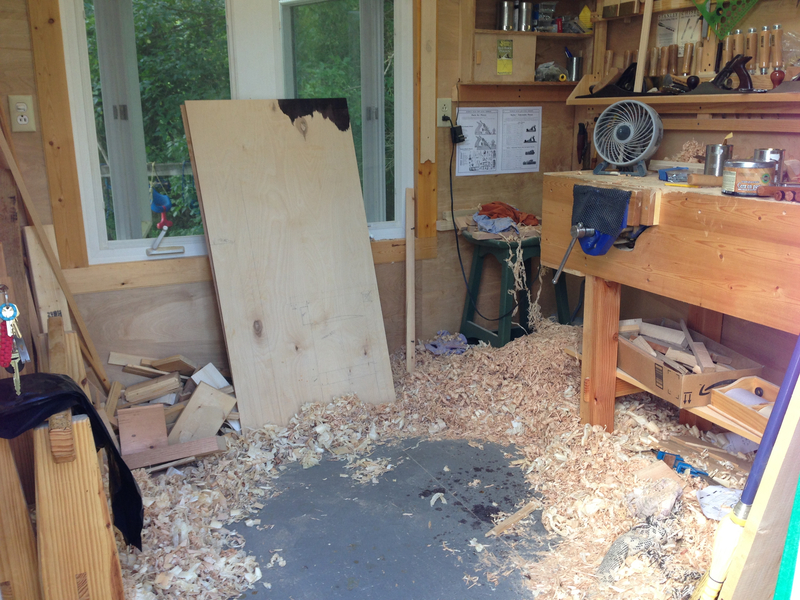 Then came Woodworking Masterclasses and I began to add tools and develop some work habits. So the shop space had sort of evolved along with my skills. I’ve been changing things around to accommodate the work flow as I went and took this opportunity to finalize those changes. I have never been one to keep things stagnate. So I’m sure there will be additional changes as time passes. Anyway, the shop is clean-ish and ready for the next project to start. This entry was posted in 8-Miscellaneous and tagged Paul Sellers, Woodworking Masterclasses. Bookmark the permalink. 5 Responses to What a Mess! I did the same recently Greg, I added an upper shelf about four inched below the apron for the shooting board, cutting board, winding sticks etc it’s really handy and easy to reach. It’s just four cornballs on each inner leg and a piece of ply. Next up is a floor box with a simple lid for under the bottom shelf for largish items. Sounds like you are really getting your shop organized and have a plan. And out of the shavings a stool appears. Hopefully mine will be done next week. I do like the color! I knew it was still in there somewhere. The color is Lexington Green milk paint, burnished with steel wool and then shellac and wax. I was over at your site and it looks like your making really good progress. Hope to see your finished stool soon. One caution Greg, a clean shop is a sign of a sick mind some say…. just got in to humid ontario yesterday…. glad you got some releif. what are you planning next?